Why a team with no apparent experience in building card games? Pete also pointed out that, for example, things like making a lightweight and fast UI don’t require CCG experience. That said, the Sparkypants team are huge fans of the game, and they are definitely going to have team members with that experience- but it’s just as important that they have a team that can build and improve upon the game quickly. How long has this change been happening? It started sometime last year, and was in fully swing by the time CVH had his interview in January. The Sparkypants team has been rewriting the game from the ground up (incorporating all current game mechanics as well). They’re rewriting the game from scratch so they aren’t shackled to the old design choices made - it’s easier to write a new tournament mode rather than trying to fix the old gauntlet mode to allow tournaments. When will players see the switch? They’d like the new, rewritten version to go live this summer. Can they reassure us that the game balance and lore quality won’t change? It’s hard to reassure the players of this at this point, because people want to see it for themselves. However, Pete did explain that there are loremasters at Bethesda and ZOS that check things over, just like they have done with Dire Wolf. Why did they not ask Dire Wolf to make these improvements? So while the images seen on Reddit are not the final version, it seems that the space theme is staying. CVH also answered a question about having “clicky things” on the edges of the playmat. In the peel-back image shared on Reddit, one of the items on the edge is a moth that flaps its wings when clicked. This is something that came up repeatedly during the stream: Pete really likes customization. Custom card backs, custom playmats, custom avatars, custom deck images. They want to provide a lot more options for people to choose from. They also want to make card backs more visible while you’re playing, and mentioned possibly allowing players to assign card backs and avatars to specific decks (a longer-term design idea, not something we’ll likely see soon). The game client will be much faster (CVH reports that menus are now lightning fast). It will also be a smaller file size, particularly great for people on mobile, so they can download over cellular data instead of needing Wifi. 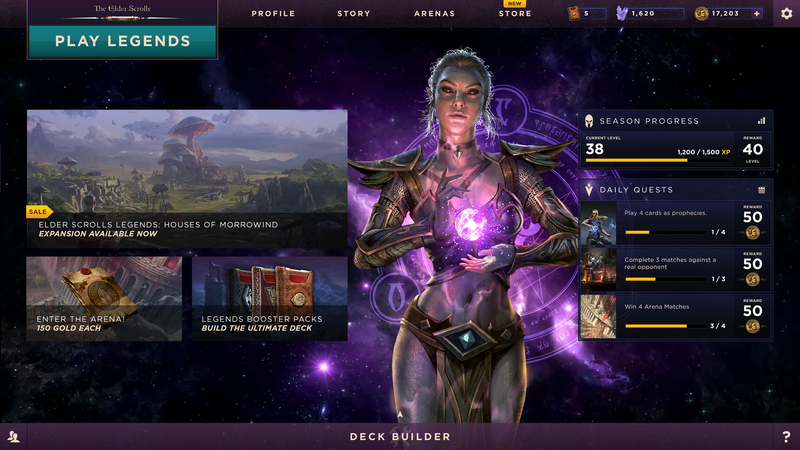 Other improvements include a better chat, dual-spectator mode, in-game leaderboards, the ability to open all your card packs at once, and easier ways to import and export deck lists. An API for deck tracking and enriching the Twitch streaming experience was mentioned a few times. Working with Sparkypants, they hope to decrease maintenance time and make the update schedule more consistent. One of the biggest new features is going to be the ability to set up tournaments in-game, and especially being able to set up different kinds of tournaments, instead of just single-elimination or gauntlet modes. Custom private tournaments are also an option being considered. Twitch drops will continue, but they are looking at a way to prevent people from abusing the system, in particular by leaving rebroadcasts up 24/7. They want people to be rewarded for actually watching somebody actively playing the game, and not reward people who are gaming the system. The current card art is not changing for the most part. There will be some updates to premium card animations, but regular cards will only see the frame change. CVH described it as a “weathered card look” as opposed to the current frames. The current voiceovers and sound effects are likely not changing either. The game economy is not changing. The prices for items in the store will stay the same, and they want people to still be able to buy things with gold they earned just as easily as they can now. Players will not lose anything they have purchased. The rules and game mechanics will also remain the same. This includes the current level cap (Pete explained that he wanted levels and ranks to mean something, not just arbitrarily going up). Monthly reward cards will still happen, although there was a mention of an additional, better reward for players who hit Legend. More details will come as the summer goes on. In this writer’s opinion, it’s a big, unprecedented change, but this stream helped clarify a lot of details. A lot of planning clearly went into this transition, even if, as regular players, the announcement seemed very abrupt. I’m looking forward to giving Sparkypants a chance and seeing how the game evolves. And rest assured, if there's lore errors, UESP will be there to point them out.